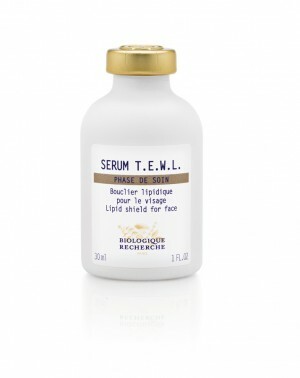 Sérum T.E.W.L, means Trans Epidermal Water Loss and protects exactly that. This super rich serum will lock in moisture and is highly recommended for lipid-deficient Skin Instants®. Its composition of mink fat to re-lipidate, barbary fig extract, jojoba and sesame oil to protect, and raspberry seed and cranberry seed oil to revitalise and replenish the skin’s surface will give you immediate comfort and protection. A great nurturing serum for colder climates and for use on skiing holidays to eliminate sensations of tightness. Dry and dehydrated Skin Instants®. Lipidic agents: Phytosterols, Cholesterol Sulphate, Mink Fat. Protective agents: Sea Buckhorn Berry and Seed Oil Extract, Barbary Fig Extract and Jojoba Oil, Sesame Oil. Repairing agents: Raspberry Seed Oil Extract, Cranberry Oil.